What’s your name and which Award did you apply for? 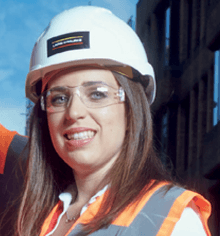 My name is Sarah Leggett and I won the Construction, Engineering and Design Undergraduate of the Year Award in 2013. I found the award application process a great taster for my graduate assessment centre the following year. Did you ever think you would get as far as you did in the process? I never would have thought that I could have won the award. I started my application because a girl in the year above at my university got to the final 20 and she said that the whole application process was great experience and really worthwhile. I then sat on my application over Christmas and then my sister said to me ‘if you don’t enter you’ll never know’, this gave me the confidence to submit my application in late January. So if you are still sitting on your application, go for it! My one piece of advice is have confidence in yourself. Has this process helped you in your career to date? This process has definitely helped me in my career to date, and influenced my career direction. I had a fantastic work experience working on a remote infrastructure project in Australia. I have worked at my award sponsor company on their graduate development programme for the last two and half years where I have worked on some exciting projects.